Louis Saha had a match to remember on the day his former club Manchester United secured the Premier League title. 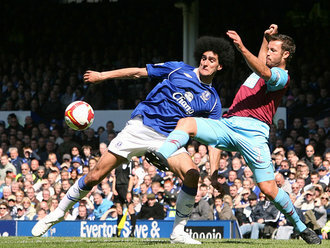 The Frenchman scored a brace in a comfortable victory against 10-man West Ham at Goodison Park. With Jo ineligible for the FA Cup final in two weeks, it was the ideal moment for Saha to stake a claim for a place at Wembley where they face Chelsea. West Ham made the ideal start and Radoslav Kovac gave them the lead before Saha equalised with a penalty after Tim Cahill had been tripped by James Tomkins. That resulted in Tomkins being sent off and the visitors imploded. Joseph Yobo put Everton ahead and Saha added a second. Everton had the majority of possession in the first half only to find themselves chasing the game. Saha dragged a shot wide of the post from the edge of the area after nine minutes having been set up by Steven Pienaar. Then Pienaar strode forward and unleashed a powerful effort from 25 yards that went narrowly over the bar. Leon Osman should have given Everton the lead in the 13th minute but screwed his shot wide of the post after Marouane Fellaini had flicked on a cross from Lars Jacobsen. West Ham responded and Kovac split the defence to release Diego Tristan. He seemed surprised at the chance and goalkeeper Tim Howard was able to mop up. Osman tested Robert Green with a delicate chip in the 19th minute before West Ham took the lead with a goal out of nothing in the 24th minute. Kovac delivered a stunning effort from distance that flew into the corner beyond Howard. Czech Republic midfielder Kovac celebrated in style as it was his first goal for West Ham after arriving on loan from Spartak Moscow. Gianfranco Zola's side were growing in confidence and Tristan clipped a shot wide of the post in the 28th minute. However, the game took a dramatic turn in the 38th minute when West Ham were reduced to 10 men. Tomkins tripped Cahill as he burst into the penalty area and was sent off. West Ham were outraged but Saha kept cool. He stepped up and sent Green the wrong way with his spot-kick to take his tally for the season to six goals. Everton took the lead in the 48th minute after some sloppy defending by the visitors. Yobo was left unmarked at the back post as Pienaar swung in the corner and rifled a shot into the net, the ball taking a slight deflection off Matthew Upson. Everton almost increased their lead two minutes later. Saha got on the end of Osman's cross but his header clipped substitute Jonathan Spector and came back off the post. Then Saha skipped away from Lucas Neill in the 62nd minute, only to see his shot go wide of the post. However West Ham suddenly launched two swift counter-attacks with Howard doing well to thwart Luis Boa Morte, then substitute Carlton Cole failed to get a decent touch in a good position. Everton extended their lead in the 76th minute with Saha's second goal of the game. He scored from close range following a cross from Pienaar, who had shown good skill to skip to the byline. Saha should have completed his hat-trick two minutes later but Green blocked his effort after he had been released by Cahill. The Frenchman was then given a standing ovation when he was replaced by James Vaughan in the 79th minute as Everton rounded off their home games with a comfortable victory before going on a lap of honour. Everton Howard, Jacobsen, Yobo, Lescott, Baines, Osman,Neville, Cahill (Jo 80), Pienaar, Fellaini (Rodwell 69),Saha (Vaughan 80). Subs Not Used: Nash, Hibbert, Castillo, Gosling. Goals: Saha 38 pen, Yobo 48, Saha 76. West Ham Green, Neill, Tomkins, Upson, Ilunga, Collison,Noble, Kovac (Stanislas 67), Boa Morte, Tristan (Cole 46),Di Michele (Spector 46). Subs Not Used: Kurucz, Lopez, Nsereko, Payne.